Sell your merchandise in style with this 5-J-Hook Straight Waterfall Faceout. The black finish of this J hook will match any color slatwall, without distracting your customers from the merchandise being displayed. Easy to apply and attach to any section on Slatwall, retailers can arrange their slatwall displays, adding their personal touch to their retail store. This piece will drastically increase the amount of space available on your Slatwall. 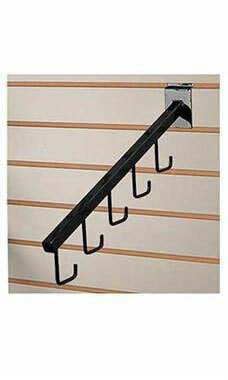 The J-Hook feature is great for hanging jackets, suits or other clothing. At the lowest price you can find, this Faceout is a great purchase for any retailer. In stock and available for immediate shipment. Very inexpensive! We use them for purses and scarves and they fit right in to our boutique look. Love these. Great value for the money! Sturdy well constructed functional pieces! Makes my store look very professional! I LOVE THESE MAKE MY PURSE WALL LOOK SO SPECIAL AND CUSTOMERS CAN REALLY VIEW THE PURSES WELL. This is great for sample books as you can remove one at a time instead of having to remove all the ones in front first.